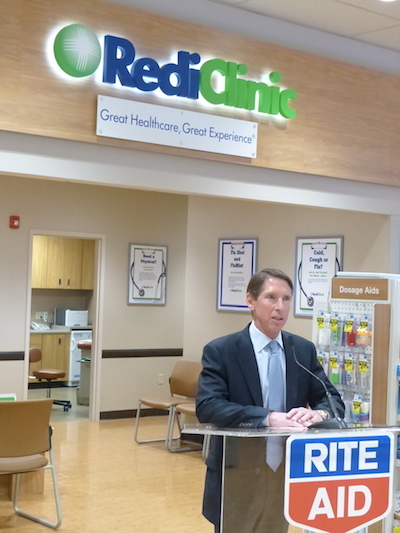 RediClinic to open co-branded clinics in N.J.
CAMP HILL, Pa. — Rite Aid Corp.’s RediClinic has formed a joint venture with New Jersey health system Hackensack Meridian Health to open co-branded retail clinics. Plans call for the first of 10 clinics to start opening later this year, RediClinic said Tuesday. The walk-in clinics will be called Hackensack Meridian Health RediClinics and be located inside Rite Aid pharmacies in Middlesex, Monmouth and Ocean counties in New Jersey. In Monmouth and Ocean counties, Hackensack Meridian Health also is a partner in nine urgent care centers and four AfterHours walk-in care centers, designed to provide convenient, cost-effective alternatives to going to an emergency room. The Hackensack Meridian Health RediClinics will be staffed with nurse practitioners who will be employees of Hackensack Meridian and overseen by local medical directors affiliated with the health network. RediClinic said the nurse practitioners will be licensed to diagnose, treat and prescribe medications for common medical conditions, as well as provide preventive services, such as health screenings, medical tests, immunizations and basic physical exams, including back-to-school and sports physicals. RediClinic’s Weigh Forward weight/lifestyle management program also will also be offered. The Hackensack Meridian Health system includes 13 hospitals, along with physician practices, more than 120 ambulatory care centers, surgery centers, home health services, long-term care and assisted living communities, ambulance services, lifesaving air medical transportation, fitness and wellness centers, rehabilitation centers, and urgent care and after-hours centers. The network has more than 6,000 physicians. In February, RediClinic announced co-branded clinics in the greater Philadelphia area under an alliance with regional health care provider Aria Health. And last year, RediClinic entered a joint venture to operate clinics with MultiCare Health System, a nonprofit health care group serving Washington’s Puget Sound region. Overall, RediClinic operates 48 clinics in Rite Aid stores in the greater Philadelphia, Baltimore/Washington, D.C., and Seattle areas and 35 clinics inside H-E-B supermarkets in Houston, Austin, and San Antonio, Texas.